I just stepped into the future of gaming. Well, that's not quite correct. I sampled one possible future: the one where you can take the power of your entire gaming PC absolutely anywhere. I walked into a Starbucks, grabbed a mocha, and sat down with my brand spanking new Nvidia Shield Tablet with LTE. Then, thanks to the magic of game streaming technology, I played Borderlands 2, Metal Gear Solid Rising: Revengance, and even Ultra Street Fighter IV in a coffee shop, miles and miles away from my home PC. If you've ever tried to stream, well, just about anything over your local cafe's free Wi-Fi network, you know it's a shitshow of epic proportions. Sure enough, Starbucks was ready to ruin my dreams. When I tried streaming Borderlands, it was like trying to play a game of Who Can Advance The PowerPoint Slidedeck With a Fishing Rod. But since I had the brand-new LTE version of the Shield Tablet, I didn't need to play that laggy, disgusting game. 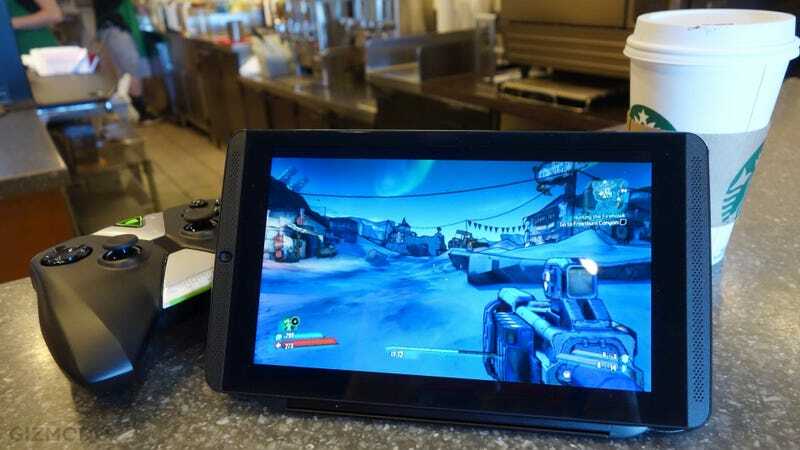 The moment I disconnected from Starbucks Wi-Fi and fired up my AT&T LTE connection, Borderlands was nearly as playable as if I had an Xbox 360 hooked up to a TV. Mind you, playable doesn't mean pretty. In order to send compressed video frames all the way from my gaming PC to my home router to my Comcast cable modem all the way through the AT&T LTE network to my tablet — and in time to stay in sync with my commands — the video feed I received was so compressed that I could see blocky visual artifacts everywhere. To Nvidia and AT&T's credit, the connection never dropped during an entire hour of play, but goddamn is it ugly. Over my home Wi-Fi network, I enjoyed a lovely HD stream, but this felt like decidedly standard definition content. Incredibly, I even managed to play some Ultra Street Fighter IV against real-life opponents over the internet. I wouldn't recommend you do the same: not only is that a bridge too far when it comes to lag, but the video stream was dropping enough frames that it was tough to react. Out of ten rounds I played, I only managed to cream my opponent once. LTE was, however, responsive enough to let me defeat a boss in Metal Gear Solid Rising by the skin of my teeth. As long as my foes carefully telegraphed their attacks, I could manage to parry their deadly blades. The reason I call this one possible future for gaming (and not the present) is that cellular data caps rear their ugly head. I used up half a gigabyte of my 5GB of AT&T data after just half an hour of play, and nearly cross the 1GB threshold by the time I left the cafe. Unles you're made of money, you're simply not going to be able to enjoy LTE game streaming on a regular basis, especially if you're paying $10 a month to share your smartphone's data plan with your tablet. For $400 off-contract or $300 with an AT&T LTE data plan (you can pop in a T-Mobile SIM instead), the LTE version of the Nvidia Shield Tablet is a fine device and a glimpse at a joyous future, but that future isn't here yet. Since it's also the only way you'll get 32GB of storage base storage in the device (the original $300 model comes with 16GB), it might be worth it so you can store more giant Android games, but you can always house other media on a removable SD card anyways. Unless you want a mobile web browsing device, you'll probably be fine with the original Shield Tablet. Read our full review of that device right here, and our gaming brethren Kotaku's review here.